Personalized Oversize Professional Hanging Address Sign - - for accountants, lawyers, doctors, dentists, and other business offices. 1 side hanging natural slate address plaque. 14" x 18" or 16" x 20" oversized hanging sign is custom made for you. Designed to hang from a bracket (your own or the optional Stone Mill wrought iron bracket shown in Related Products). Line 5 with decorative arch shape border (option 9 or A) holds up to 12 characters; height is proportional to the size of the sign. The oversized hanging address sign also comes in a two-sided version (see Related Products). 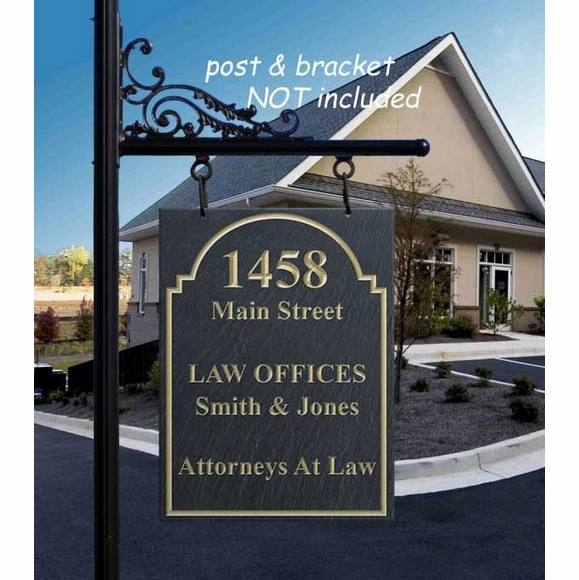 I was looking for a beautiful address sign for my newly built house and after looking for a long time online I found your company. The black slate sign is perfect. It will be mounted on a stone pillar at the beginning of my driveway. It is very elegant and well made and I am very happy with it !! !